For those who enjoy platform games on the iPhone, one recent app addition to the genre that may potentially be appealing is Super Retro Ninja, which was developed by Top Best Adult Entertainment. Super Retro Ninja takes place in the well-known Super Mario world, but instead of one of the Mario brothers as the protagonist, the game revolves around Kirby. The plot of the Super Retro Ninja app revolves around Kirby as he is sent into the Mario World and must travel through the maps in order to defeat his opponents. Unfortunately, the developers did not write much of a storyline to this app, and those who enjoy in-depth plots may be disappointed. Luckily, gamers who loved the Super Mario series will likely still find this app to be intriguing, as there are many similarities. 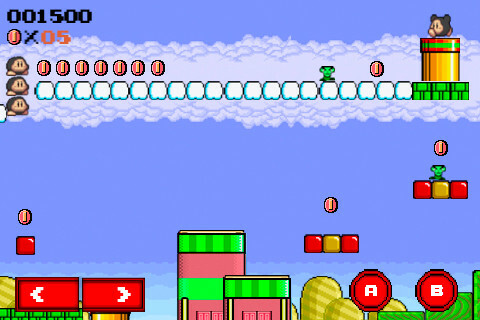 Kirby must leap on enemies, traverse giant pipes, and collect coins as he ventures through the app, all of which were noteworthy characteristics of Super Mario games. Those who enjoyed these attributes in the Mario series will enjoy them equally as much in Super Retro Ninja. Although the game does an excellent job of emulating the appealing attributes of Mario and other popular platformer games, the main drawback to Super Retro Ninja is that the controls are incredibly difficult to work with. In order to maneuver throughout the map, very precise jumps must be made, and the controls have not been set up effectively in order to successfully complete the necessary tasks. This will likely leave many gamers incredibly exasperated with the inability to complete basic maneuvers, and significantly detracts from the quality of the app. Another noteworthy flaw with Super Retro Ninja is that it is incredibly short. The iPhone app has a disappointingly low number of levels and it would not be difficult to finish the entire thing in an hour or two. For some players, this may not be a problem, as they are only interested in playing for a short period of time before they become “Bored” and wish for something new to play. For those who enjoy games that require an immense amount of time and effort to finish, however, Super Retro Ninja would not be a favorable option. Overall, Super Retro Ninja does have many appealing aspects and is not a completely intolerable game, but may leave many players frustrated due to the poor controls and low number of levels. 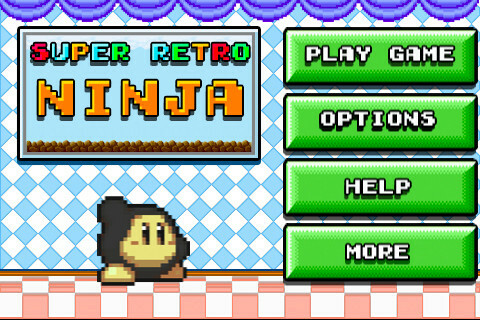 Although many players may wish to avoid the app, those who love Kirby or enjoy the Super Mario series may still be able to derive great pleasure from Super Retro Ninja. AppSafari review of Super Retro Ninja was written by Joe Seifi on November 2nd, 2011 and categorized under Adventure, App Store, Games, Platformer. Page viewed 4075 times, 1 so far today. Need help on using these apps? Please read the Help Page.